(Nanowerk News) It is well-known that metals conduct electricity and that insulators prevent its flow, but imagine being able to change a material from a metal to an insulator and back again using only light. The ability to do this would be incredibly useful for making ultrafast optoelectronic devices for advanced computing applications. Some materials have shown the ability to switch from insulators to metals under light pulses. However, it is much more difficult to perform the reverse change from a metal to an insulator. 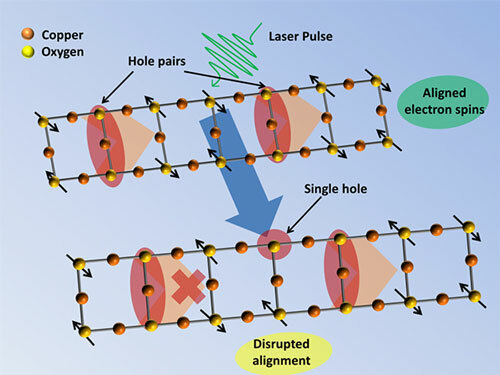 A team led by Ryo Fukaya has examined the effect of ultrafast laser pulses on a low temperature superconducting material ("Ultrafast electronic state conversion at room temperature utilizing hidden state in cuprate ladder system"). At room temperatures, the superconductor behaves as an insulator, containing long "ladders" of copper oxide. Studying the way that light interacts with the superconductor at room temperature—and the effects of laser pulses on the material—gives insight into the change between metals and insulators.